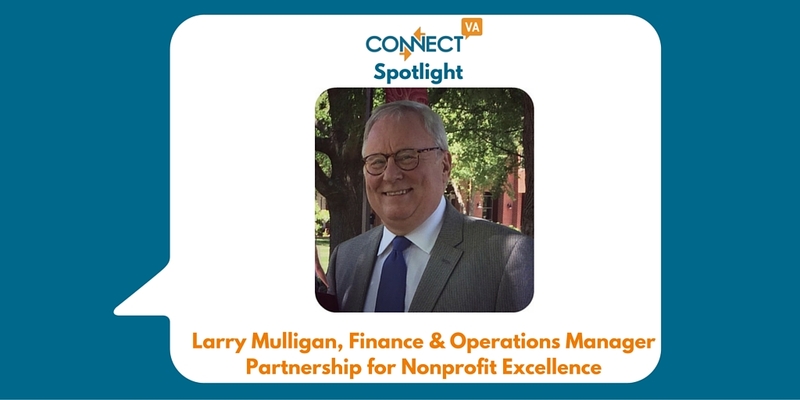 Hi, I am Larry Mulligan and I am the Finance and Operations Manager at The Partnership for Nonprofit Excellence (PNE). I joined the organization last April. My involvement with the nonprofit sector started when I retired from the corporate life in 2011. In fact, the day I retired I was driving home and heard a commercial for FeedMore by Mark Smith – he said, “if you want to help call me” – so I did and I talked to him for 15 minutes and he connected me to FeedMore the very same day. This conversation was the beginning of my nonprofit experience. I started out doing volunteer work at FeedMore and then eventually took on projects for them on a consulting basis. I really enjoyed the work, the people and the feeling of contributing to the community. This led to other consulting assignments and then to PNE, coincidentally I saw this position here on the ConnectVA Job Finder. I am responsible for the financial activities within PNE, which includes four distinct programs – HandsOn Greater Richmond, ConnectVA, Nonprofit Learning Point and Organizational Solutions. Each of them has different activities and idiosyncrasies. I am bringing my corporate financial and operational background to the vastly different and challenging nonprofit world. In addition, I am establishing and clarifying the accounting policies and procedures to allow the program managers consistent and timely financial information and results for their programs. This is an interesting question; I really like that over the last nine months I have been able to utilize my experience to get non financial people aware of the financial issues facing us on a daily basis. Even better was when I began getting questions on how daily activities should be handled from the financial side before they happened. That was a big day for me; I felt like I was making a difference and the people accepted my contribution. Being involved with the programs as they prepared their operating budgets and sharing financial results on a timely basis, helps the program managers do their job and that gives me a real sense that I am helping both them and our mission. The biggest challenge I faced was getting acceptance from the other staff, most of which have spent their entire career in the nonprofit sector- they did not truly understand me or maybe had never met a finance manager who wanted to know every aspect of their programs. The first thing I did was sit down with each manager and go into detail about what they did and how they did it! I explained the more I know about your operations the more I can help – some were a little skeptical! Thankfully, I think all the time I spent up front learning about the programs and benefits they provide has helped established my credibility and usefulness. Well every day we need to look at how we can utilize and balance our financial resources and our operational goals. We help other nonprofits with increasing capacity and this requires us to offer our programs in the most efficient and cost effective method available. That means we need to look at what we do and how we do it and what it will cost – and I get to be a part of that process! I look at ConnectVA daily to see what resources are available for training purposes, both on the finance side and professionally, so I can do my job and stay up to date on what is happening within our sector. All my colleagues here at PNE are from a different generation than I, and it is fun to see and feel the excitement they bring to the workplace on a daily basis. It rejuvenates my desire be part of the organization and the nonprofit sector. ConnectVA Spotlight: Shareta Berry, Driven 2 Destiny Outreach Center Inc.